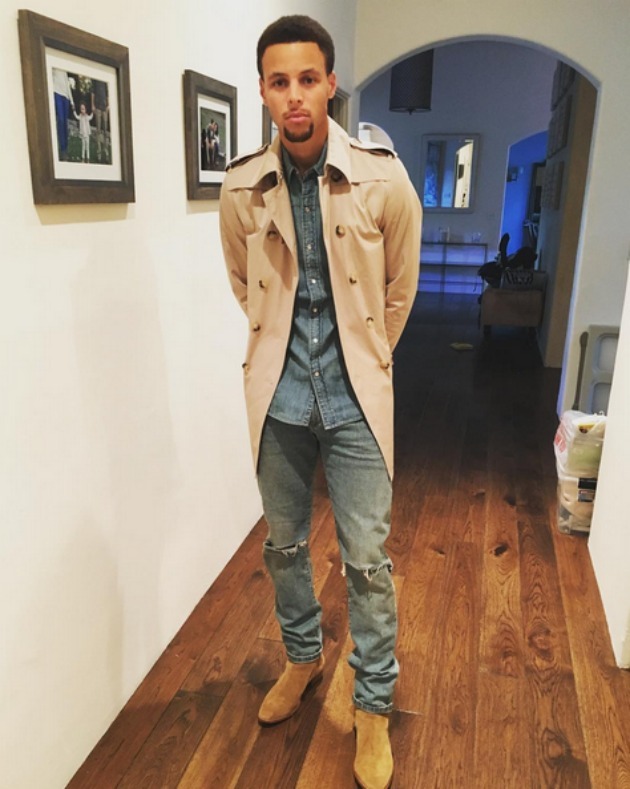 Stephen Curry is blowing everyone away with his on-court prowess this season, and now Dress for the Day is dissecting four of the stars ensembles so you can look as good as the Warriors star when you hit the town. Stephen Curry is blowing everyone away with his on-court prowess this season, but the reigning MVP knows a thing or two about style as well. Dress for the Day is dissecting four of the stars ensembles so you can look as good as the Warriors star when you hit the town. You can also pick up some tips from the Dress for the Day website. Be sure to check out the app as well as previous editions of the style guide for more tips on how to look your best. He’s breaking records on court and shattering the style game off court. Even dressed down in a casual outfit, Steph is fashionably flawless. To get his look, start with a simple plaid button down shirt like this or this. Pair with some dark-wash jeans like these budget-friendly ones or these splurge-worthy ones. Finish the look with some light brown leather sneakers, similar here. All it took was three easy pieces to steal his look and all it will take is a small miracle to rival his half-court shot. Triple threat alert: an unstoppable force in the NBA, knows how to dress and then some and has a beautiful woman by his side? So many goals, we don’t even know where to start. Maybe by trying to copy his cool varsity style. Get yourself a black and white varsity jacket like this. Add some slim-fit black jeans like these or these and a sporty black watch. Finish the look with some classic white sneakers like our favorite here. 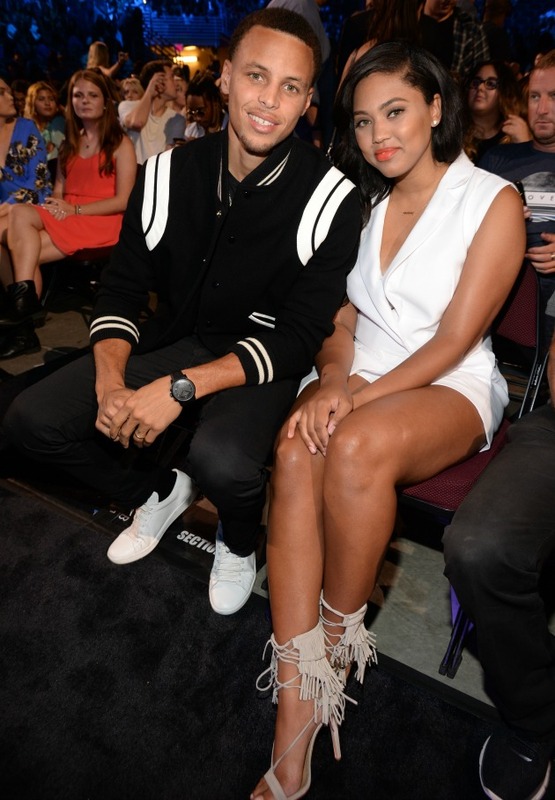 Scoring a lady as fly as Steph’s wife, Ayesha, is going to be hard but at least you’ll look the part to get started! 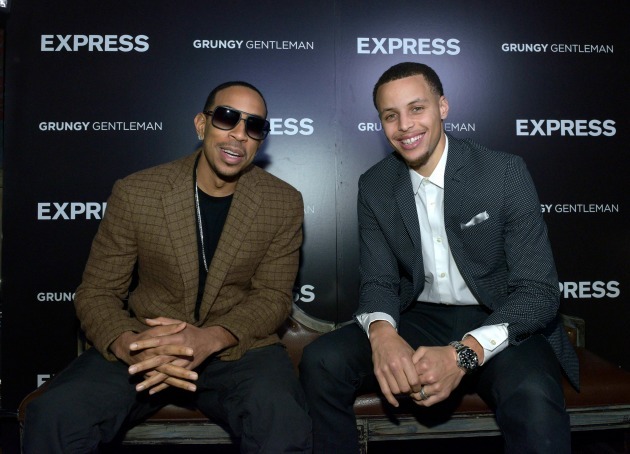 It’s no surprise that Curry was asked to be the brand ambassador of Express and he definitely does the fashion house proud by expressing his personal style (see what we did there?) in so many unique ways. Don’t own a two-tone printed blazer? Better get on it with one like this before it sells out! A classic white button shirt and a silver pocket square are what you need next, followed by a statement silver toned watch. Wear with your favorite pair of jeans like these and don’t forget to keep your footwear fresh with some black loafers like these or these. Wonder what he and Luda are up to? Perhaps a music collab is in the works… #quadruplethreat is more like it. We saved the best for last. Steph redefines the denim on denim look and shows us how to splurge like a boss. The price tags on these pieces are not for the faint of heart but when you’re referred to as the “golden child,” platinum spending is not an issue. His Sandro trench coat is now sold out, but you can score an equally snazzy one here. A chambray button down shirt like this and some medium-wash destroyed denim take cowboy chic to a new level. And of course some tan, suede cowboy boots like these are a necessity to ace authentic Western wear. Now, that is some slam-dunk style.